Every one in the family was excited when the baby arrived, except for new mom Charlene Ni. She was sad, irritable and had no energy. The 31-year-old pretended to be happy but cried in secret. She was suffering from baby blues. Her husband and mother-in-law couldn’t understand her feelings. They thought she was too sensitive and asked her to be strong like other new mothers. Her son is 1 year old now, but Ni still grieves every time she recalls her first month after childbirth. What Ni suffered is not uncommon. 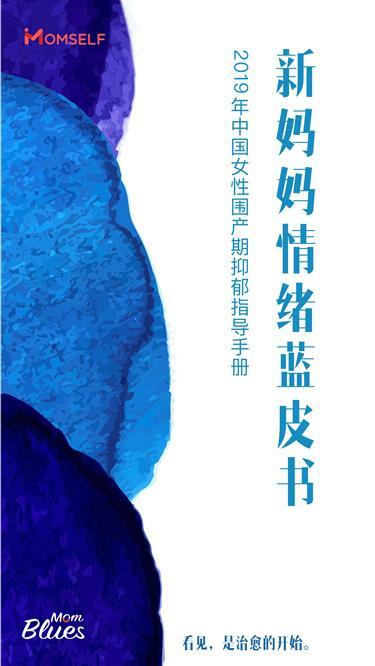 In January, China’s first guidebook of perinatal depression, “Mom Blues,” was revealed in Hangzhou. It shows that 48 percent of respondents felt depressed within three months of childbirth. “Mom Blues” is a cooperation between psychiatrists from home and abroad and Momself, a Hangzhou-based self-media. It took more than three months to complete an online survey and gather statistical facts. Over 21,000 questionnaires were successfully filled in and collected. Medical facts, statistics and professional advice provide people with a comprehensive and objective plan to deal with the perinatal depression. The survey reveals that 74 percent respondents became sensitive and couldn’t stop crying, while 70 percent were irritable and suffered anxiety three and four days after giving birth. Most moms recovered within a month, but 20 percent spiraled into depression and required professional psychotherapy. The National Bureau of Statistics acknowledged that about 18 million new babies are born each year, and the World Health Organization revealed that 60 to 80 percent of new mothers had some degrees of depression following pregnancy. That means at least 10 million women were unhappy during perinatal period in the country. “Mom Blues” gained social support from medical organizations, professionals and the media. Psychiatrists, including Tao Ming from No. 2 Affiliated Hospital of Zhejiang Chinese Medical University, Li Songwei from Peking University, Wang Danzhao from Emory University and Associate Professor Hu Lingqun from Ohio State University, contributed to the text. “I have a lot of new mothers as patients. They only turn to treatment when symptoms become aggravating. Some suffered from mood disorders before pregnancy and then relapsed after childbirth,” Tao told Shanghai Daily. One of Tao’s patients jumped from a building and broke a leg. She originally planned taking her baby with her to jump. But her mother noticed a change in her behavior and rescued the infant. Perinatal depression could happen to anyone, regardless of social status or education. Family support helps to lower risks of depression. Depression can’t always be avoided but there are preventive methods that can help women recover from mood disorder. Remarkably, only 16 percent of respondents said they got family support. Around 48 percent of mothers said family members did not understand their mood swings and even accused them of being too sentimental and irritable. In China, there were other factors causing baby blues. The tradition that a mother-in-law helps nursing babies often brings about family squabbles. “When I planned to wean, my mother-in-law insisted on breastfeeding regardless of my body conditions. That escalated our contradictions and aggravated my depression,” Ni said. Thousands of respondents gave details of conflicts between themselves and their mothers-in-law. The differences of strength, parenting methods, ability to learn and professional knowledge would cause contradictions. Sometimes, husbands defended their mothers, which in return intensified conflicts. In addition to women, hundreds of men also completed the online survey. A new baby not only impacts on new moms, but also puts pressure on fathers. About 47 percent of men respondents admitted they also got the baby blues. “Mom Blues” gives professional advise on how to handle depression, including professional treatment, face-to-face conversations with family members and talking to someone you can confide in.